Let’s face it; there isn’t any knife in this world that doesn’t get dull over time. So it would be best if you look for a high-quality, sturdy yet not too pricey knife sharpeners. 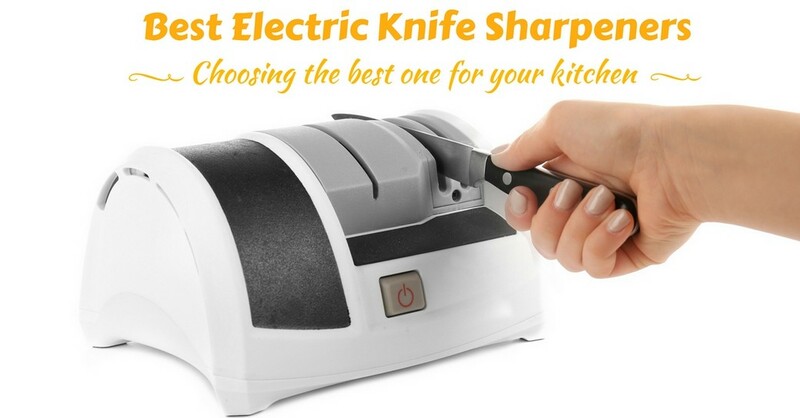 In this article, we will be listing down the top picks for best electric knife sharpener but first, let us uncover the secrets and history of ﻿knife sharpeners. Even in the ancient times, people who have used knives also needed the means to sharpen them, even if it is using a simple rock. Any hard and rough surface which is harder than the knives can make it sharp. A window sill and sandstone were also considered to be used when sharpening the knife. There is no record of when and who actually invented the first sharpening steel. According to the study done by University of Colorado, “prehistoric people developed a method of sharpening tools and stone knives at least 75,000 years ago". ”The “Moletas” or the western style grinding or sharpening can actually be traced back all the way from Northern Italy. Trento, Italy became the center of knife grinding tradition. DID YOU KNOW? The smaller the angle between the blade and stone, the sharper the knife will be. Sharpening/Grinding – it is the process of removing metal to form a new edge. Straightening/Steeling – it is the process of straightening the metal on the blade but not exactly removing a significant edge. Polishing/Stropping - it is the process doing renewing the blade by giving it a mirror finish but not exactly altering the edge. When blades are damaged by a compressive force or also known as buckling and if pressed into a hard object just like bone or ice and also by bending from sideways pressure, it rolls the edge of the blade due to metal ductile nature. DID YOU KNOW? Blades can be damaged just by simply cutting lemons and tomatoes because of their acid. Once you are done using your knife, you have to clean it right away but NOT with a use of harsh detergents. Elias Cairo, chef and owner of Olympia Provisions said that “I had the same knives since I was 15, I don’t like to use harsh detergents on my knives, I wash them with mild soap with my hands and immediately wipes them dry after I wash it.” Because the pressure of the dishwasher can knock the knives around that would dull the blade. 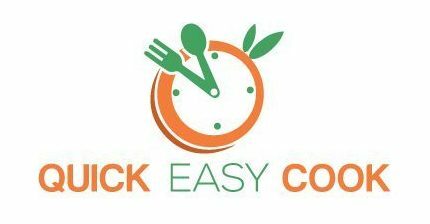 This is probably the most important one: Using the right knife – It would be great if you know which knife is appropriate for meat, vegetables, fruits etc. Thinner Blade – is supposed to be used on cut fillets, roast for stuffing or butterfly steak. Thicker Blade – is supposed to be used for chopping or slicing. Slicing Paper – If you can slice a paper effortlessly with your knife and it doesn’t catch even a tiny bit of tear then your knife is indeed sharp. Shaving Sharp – Shaving hair in your arms with your knife means your knife is incredibly sharp and it doesn’t need to undergo other tests. Fingernail trick – *this can be dangerous so you have to be extremely careful* Lay the edge of your knife very gently on your fingernail. If the knife bits into your fingernail then your knife is very sharp. Slice an Onion – An onion as we all know is very slipper and its skin is very thin so if your knife can easily catch and bit into the skin of an onion then it is sharp. Our top pick is non-other than the Presto Eversharp. It is cheap and reliable when it comes to knife sharpeners. It truly proves that the price sometimes doesn’t matter, because some expensive ones don’t work best at all times. What I like about the Presto Eversharp is that it is very small and compact which is great if you don’t have much space in your kitchen. It is perfect for beginners and common household. It provides 2 stages that make sharpening faster. This portable electric sharpener has a 3 stage process that guarantees amazing results. Despite the fact that it is too pricey, it has a 100% diamond abrasives in the first 2 stages and the final stage is for polishing and may be used for very dull knives. 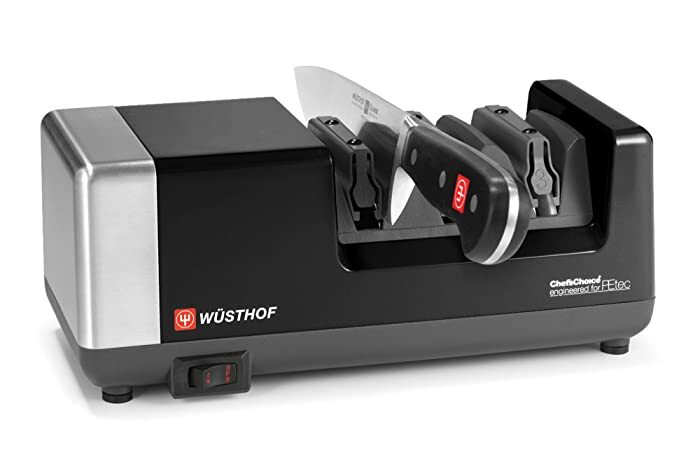 This German company provides high-quality products and with this 3-stage knife sharpener, the quality really is above average with its promise to bring ultra-sharpness after sharping your knife. It is also pretty similar to the previous one. 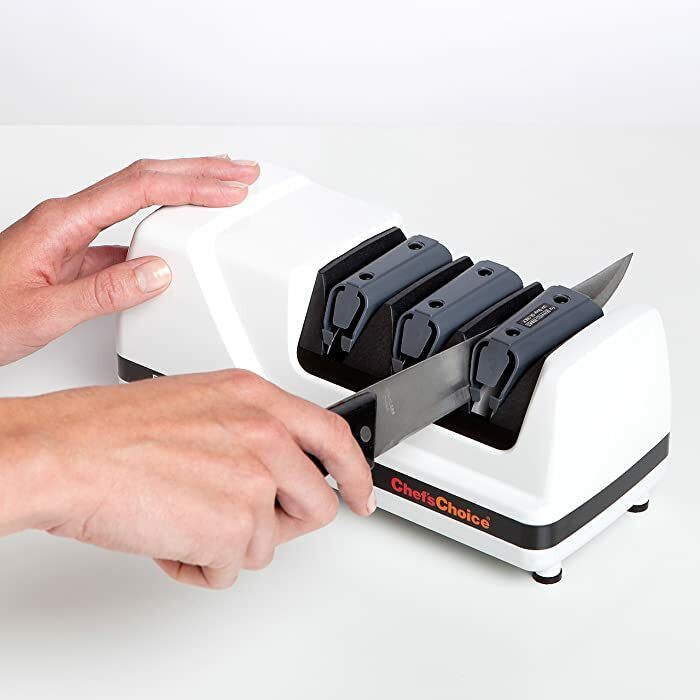 This knife sharpener is one of the most versatile knives you will come across with. It is good for Asian, European and American knives. It is made in the USA so it sturdy and must last long. It also comes with the diamond abrasives and patented flexible stropping and polishing disc. It also has a multi-stage sharpening system. 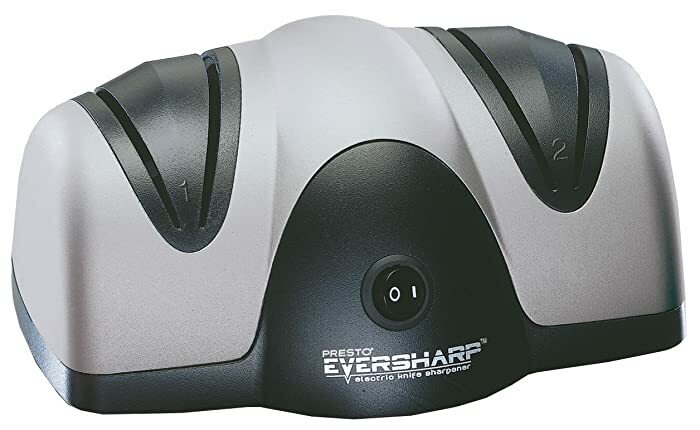 This knife sharpener is very quick and very easy to use. This has ceramic wheels with diamonds on them but it only features one sharpening stage, therefore, you cannot expect it to get polished. And because it doesn’t have any stages, it is not too complicated to use, unlike the previous ones. You just pass the knife through the slot and simply get it out. There you have it, simple as that. Every knife sharpener has different features but the best one for me is the Presto 08800 EverSharp. It is précised and not too complicated to use. It is best for unprofessional chefs or the people who only started to use their kitchen. It always depends on your choice and your abilities. 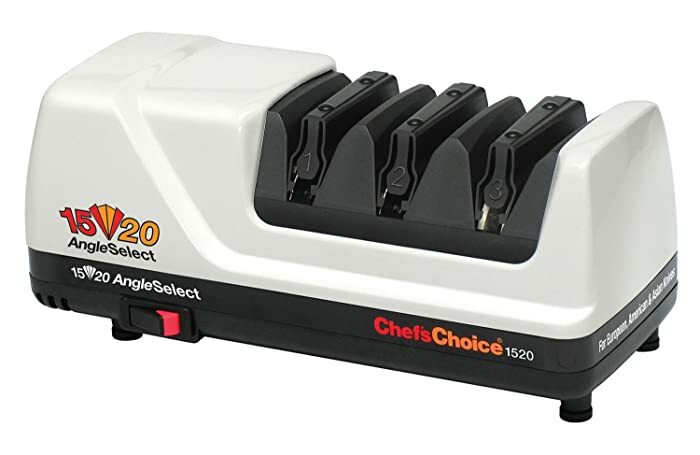 If you are a pro then go for the Chef’s Choice ones since it has more features. But if you are in between pro and amateur just asses what you really need and what kind of skills you have. If you're looking for smaller knife sharpeners like pocket knife sharpeners, check them here.